The eBay Store: It's a much talked about, yet little understoodand underusedselling venue. For a brief period, sellers basked in the glow of easy sales when Store items bubbled up near the top of eBay search results, along with regular auctions. But even under eBay's new Best Match formularesulting in more modest placement of Store items on eBay's search results pagesStores are still a great way to sell your items as part of a comprehensive eBay strategy. In fact, if you sell regularly on eBay and do not have a Store, I believe you are at a disadvantage. 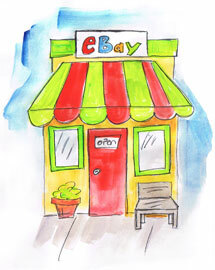 What exactly is so great about an eBay Store and what exactly can one do for you? Let's break it down. They say eBay is a numbers gamemeaning you need to list a lot of stuff to see enough bids. But it's also a patience game. By that I mean sometimes your item needs time to wait for the right buyera lot of time in some cases! As an example, one of the types of things I like to sell is yearbooks. They can sit for months and months, but when they do sell, it's often for healthy sums. I recently sold a yearbook that had been languishing in my eBay Store for about a year. It went for about $70. But the cost of hosting it in the Store was only around 60 cents. (This does not include the $15.95 Basic Store monthly fee; but you have to spread that cost across all your Store listings). The eBay Store is the perfect inexpensive, low-maintenance place to park those listings until the right set of eyeballs comes along. Who doesn't love a sale? eBay Stores have this great, fun little tool called Markdown Manager that lets shoppers see your original price crossed out and the new lower price in its place. It's great for buyer psychology and I've found it effective for moving the merchandise. To get to it, select "Marketing Tools" from your left-hand Store dashboard, then "Markdown Manager" under "Item Promotion." (I'd prefer to see it moved up a level, but what can you do). I don't see many sellers using Markdown Manager, and I don't know why because I think it can be very helpful. My guess it they may just not know about it. eBay makes it easy to send out e-mail promotions to the people who request it. You don't need any layout or graphics experience to use this; they've made it very easy. You can easily access their e-mail tools by going to Marketing Tools > Store Marketing > Email Marketing. They show you different e-mail templates and wording you can use. Sometimes customers just need a little reminder that you're there. You can use the Cross-Promotion settings, found under Item Promotion in the Store Marketing area of your eBay Store, to define what shoppers will see when they view your items. This is based on what categories you create in your store, e.g., Books, Jewelry, Clothing, etc. You may only have one category if you specialize in one type of product. This can be useful for "cross selling" items that are complementary. That is, if you sell both shirts and ties, you can choose to cross-promote those two categories. So if you sell on eBay and do not already have an eBay Store, I highly recommend building one. But unless you sell in high volume already, I do suggest starting with the much less expensive "Basic" Store, which has the lion's share of the functions a seller needs, in my opinion. And at $15.95 a month, it's affordable. Now start setting up that virtual window display! Ok so I am really late replying to this thread but I just found it. I had the same thing happen. I started a sale at the beginning of June to run for 30 days. It is STILL running today....months later LOL. Aren't the low listing fees in a Store offset by the higher (10%) fees on sales?